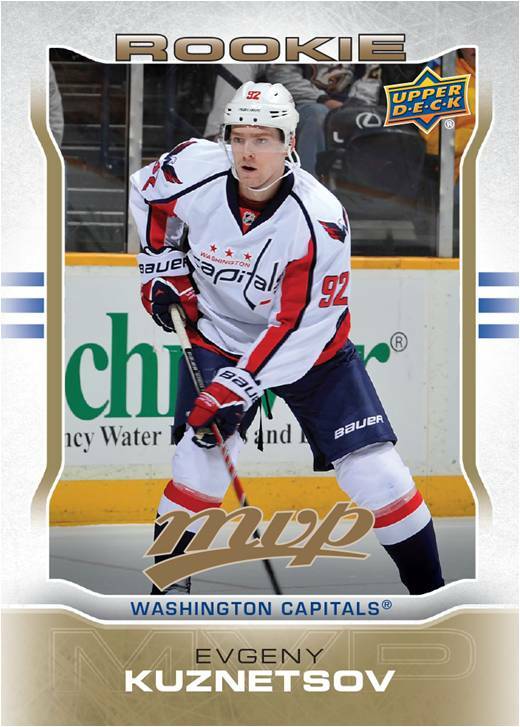 2014-15 Upper Deck MVP Hockey marks the beginning of the card maker's take as the lone NHL card license. The low-end release brings back a brand from the past that has been relegated to insert status for the past few years. 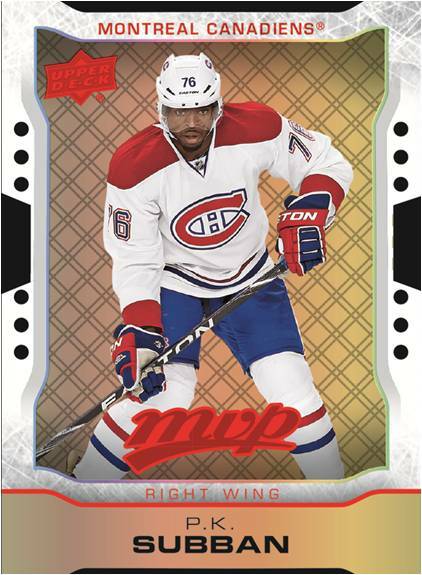 The 2014-15 Upper Deck MVP Hockey set consists of 300 cards, the final 100 of which are short prints. And while the High Numbers cards do make finishing the set a little tougher, they land one per pack, so it should still be somewhat affordable. 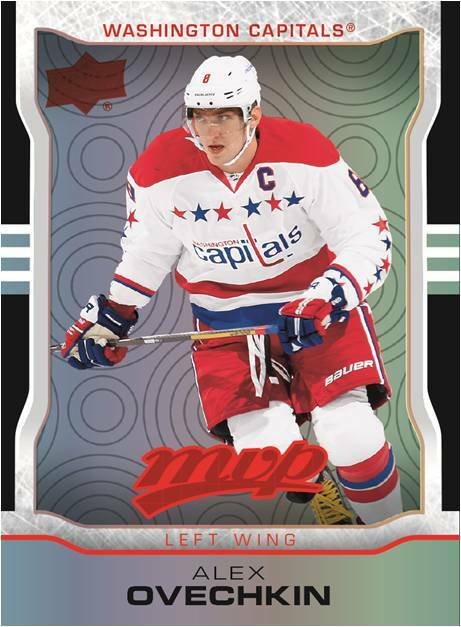 Included on the checklist are several rookie cards of players who debuted late in the 2013-14 season. Evgeny Kuznetsov and Teuvo Teravainen are among them. The base set has several levels of parallels and variations. Silver Script are back, landing one per pack. Super Script (#/25), another brand staple, also return. These are numbered to 25. Gold Scripts (#/100) are exclusive to blaster boxes. Colors and Contours combine Spectrum Light F/X card stock and die-cuts to recreate the base set in three different colors, each with its own three tiers of rarity. Combined, they land six per box. For long-time collectors, the tiered structure is reminiscent of those found in many late-1990s releases such as 1997 Leaf Baseball Fractral Matrix and 1998 UD3 Baseball. 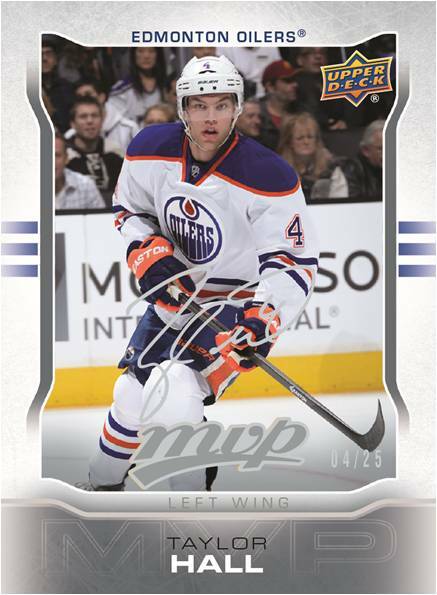 Every 2014-15 Upper Deck MVP Hockey hobby box has one autograph, memorabilia card or Super Script parallel. 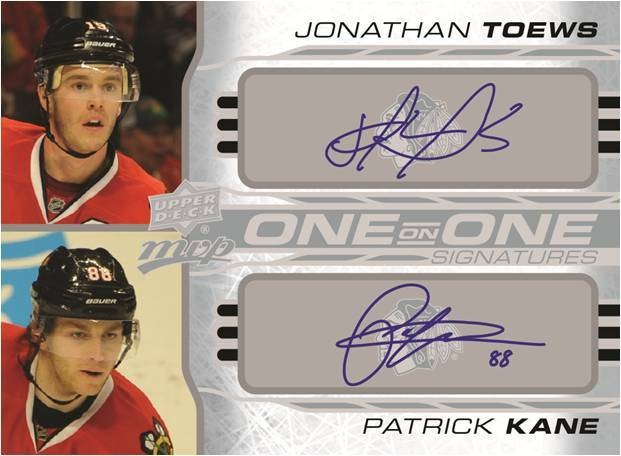 Signed cards come in the form of Prosign (1:132 packs) and dual-signed One-on-One Signatures (1:2,612 packs). Collectors can find three types of memorabilia cards. Souvenirs jersey cards come with both one (1:120 packs) and two (1:320 packs) swatches. 2-on-2 Dual-Sided Jersey Cards (1:480 packs) have a total of four swatches from four different players. Three basic insert sets focus on standout performances from the 2013-14 season. These include Three Stars Weekly (1:7 packs), Three Stars Monthly (1:48 packs) and Rookie of the Month (1:40 packs). Rounding out the product are four different Rookie Redemptions (1:384 packs). Each is good for nine cards, all from the same division. Please note that images shown are mock-ups. Designs and content are subject to change. This is great! I have always liked the MVP set. Chris � It’s a mock-up. They’re often done quickly to help promote sets. You do NOT get an auto, jersey or Super Script per box. I didn’t and contacted UD. They responded it is not guaranteed. Someone lied or they pulled the bait and switch. Fantastic for a low-end product. In the five boxes I’ve busted, I’ve hit one auto, two jerseys, a double jersey, a 2-on-2 jersey, three super scripts (one was Tavares) and a couple of good colors and contours (including Crosby and Nugent-Hopkins). I have no complaints about this product whatsoever, when you factor in the retail price. Love the NHL Three Stars subset. Wish they would do “League Leaders” again! Bought one box and it was actually very good! I got a Adam Henrique souvenir and a Pacific Division Rookie redemption! Will def be buying more! 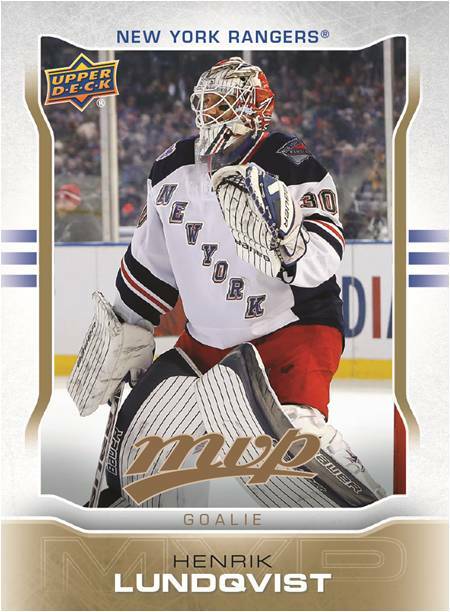 With the focus lately centered around Panini National Treasures and the short wait for The Cup, MVP snuck in under the radar with great stuff. In 4 hobby boxes, I pulled all the rookies in colors and contour variations as well as two autos and a 4 swatch jersey. Didn’t quite build the set but I’m very close. For an affordable product, I think it’s pretty well rounded. Anyone notice that the Martin Hanzal card #107 is actually a picture of Keith Yandle? I’m good with this haha i bought a box with a friend and i got myself a Ryan Nugent-Hopkins Black printing plate, one of one. This is just great. bought one box got the 2on2 jersey a few colored ones, my jersey is badly printed with lots of defect on it plus one colored card a line going straight trough out the front looks like a cheap set to me… not sure i’m gonna buy more boxes unless the price go down ! Have to say I was very pleased with this product. I got a black printing plate card. Is a one of one card! Among other good cards. I got an Adam Larsson Pro Sign card which is really cool. These cards are good if you want to build a little team to. You are able to build a team that is good but not too good. You can also trade with friends and get the rest of your collection. Bought my first box of MVP 14-15 and I was really surprised! So yeah, this product is really nice! !